Created 2,300 years ago by volcanic eruption, Lake Myvatn features craters, mud pits, lava columns, distant mountains, and lifting steam. The large amounts of algae in the water support many aquatic plants and fish, and the wetland environment is home to many species of waterbirds, including 13 duck species. You'll find a hot spring lagoon, a geothermal cave, and a bird museum nearby. You can also fish or hike in the area, including to the Krafla volcano. Our Lake Myvatn route builder makes visiting Lake Myvatn and other Lake Myvatn attractions simple, and helps you make a travel plan personal to you. In September, the Mývatn is mosquito-free, so very enjoyable. The wide open landscape, the beautiful Lakeside, this little civilization and the one or other volcanic cones are a completely different feeling. Only the smell of sulfur is sometimes awkward. Most unique lake I have ever been too and so much to do near and around it. Only regret was not staying long enough to explore more. Will be back!! I love this place, and I'm so glad I got to see more of it in the summer, but my allergies murdered me there this season and of course there are the midge flies. Still not as bad as mosquitoes. Amazing views of a beautiful crater. Definitely worth the time to go see. Every day, we help thousands of travelers plan great vacations. Here are some tips on how to use your Listing Page to attract more travelers to your business - Lake Myvatn. Promote your permanent link - https://www.inspirock.com/iceland/lake-myvatn/lake-myvatn-a325412577 - on your website, your blog, and social media. 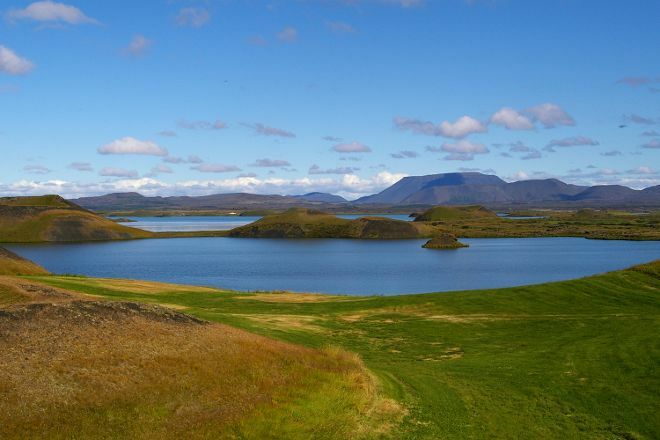 When a traveler builds a plan from this page, the itinerary automatically includes Lake Myvatn. This is a great way for travelers looking for a great vacation in your city or country to also experience Lake Myvatn. Promoting your link also lets your audience know that you are featured on a rapidly growing travel site. In addition, the more this page is used, the more we will promote Lake Myvatn to other Inspirock users. For best results, use the customized Trip Planning Widget for Lake Myvatn on your website. It has all the advantages mentioned above, plus users to your site can conveniently access it directly on your site. Visitors to your site will appreciate you offering them help with planning their vacation. Setting this up takes just a few minutes - Click here for instructions.